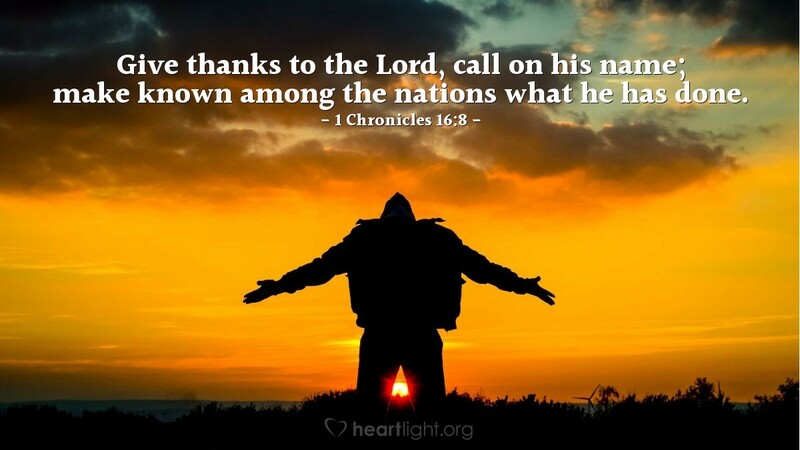 Giving thanks is more than being thankful to God, it is letting others know of his gracious works so they too can come to know him as Father, Redeemer, and Victorious Lord. Then others can join their voices with our own in a chorus of thanksgiving from the hearts those God's love has redeemed. Holy God, Almighty King, bless all those who serve you in difficult places today. I especially am thankful for all the missionaries in other cultures sharing the grace of Jesus with people who need to know you as Abba Father. Empower their words, protect their lives and families, and bless their efforts with fruit. Please help me to understand that true thankfulness involves sharing your grace with others. In Jesus' name I pray. Amen.